UPDATE: POLICE IDENTIFIED THIS SUSPECT AND HE WAS ARRESTED IN NORFOLK. HE ALSO COMMITTED THE WALMART SHOPLIFTING ON 09/16/2017. Virginia Beach Police need assistance in identifying this suspect. On September 21, 2017, at approximately 10:00 am, this suspect entered the Wells Fargo bank at 5293 Princess Anne Road, approached the teller with a note demanding money. The suspect left the bank and headed toward Sentara Leigh Hospital. UPDATE: POLICE IDENTIFIED THIS SUSPECT AS THE SAME SUSPECT IN THE WELLS FARGO BANK ROBBERY ON 09/21/17. SUSPECT ARRESTED! Virginia Beach Police needs assistance in identifying this suspect. On September 16, 2017, the pictured male went to the Walmart at 2021 Lynnhaven Pkwy. He filled a shopping cart with almost $400 worth of grocery items and attempted to walk out without paying. Loss prevention stopped the male. He pushed the employee out of his way and ran out of the store. He was seen getting into a dark 4-door vehicle. On December 22, 2016 at 10:15 am, the two females pictured, entered the Food Lion on Laskin Road and proceeded to fill a shopping cart with over $400 worth of groceries. After the credit card one of the females tried to pay with was declined, the two females pushed the cart straight out of the store and loaded the groceries into a blue Hyundai and left. 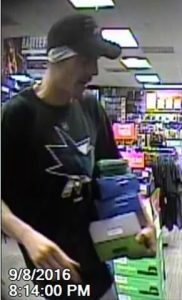 On September 8, 2016, the pictured suspect was in the Game Stop at 4001 Virginia Beach Blvd. He picked up several games and two sets of controllers for an XBOX One. The suspect asked the employee to retrieve another item for him that was located in the back of the store and then ran out of the store with all of the items he already had. 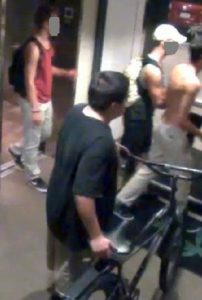 On August 27, 2016, between 2:30 and 3:00 am, four white males entered the parking garage of an apartment building in the 300 block of Laskin Road and stole several bicycles. It is questionable as to whether or not these suspects are adults so their faces are not shown in these photos.